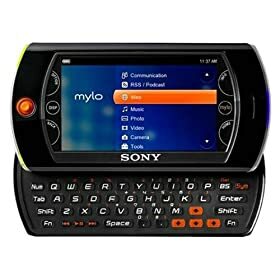 Sony MYLO Personal Communicator – (around $200) If you like to surf the internet and need a device that does it all better than most cell phones, the MYLO is a fun gadget. This “Personal Communicator” works on the 802.11 b/g Wi-Fi standard making it easy to join wireless networks. Unlike an iPhone though, it is set up to make free Skype calls (to other Skype users and for a charge to regular phones) right out of the box (iPhone users must download special software and configure). The MYLO also has an MP3 player, plays MPEG-4 videos and has a 1.3 MP camera built in, which makes online photo sharing simple. But the best part is the integration with popular sites like AIM, YouTube, FaceBook (with Facebook Notifier) and ShoutCast, making this a fun electronic toy from the moment you open it up. The MYLO (for My Life On-Line) is definitely targeted to the younger user who is looking for easy integration to these popular social sites. Other devices can be rigged to do the same things, but few are set up to use them as quickly as the MYLO. If you travel overseas, this could be a great option for portable telephony without outrageous roaming charges. While you’re limited to WIFI areas, these are more and more common, especially in Asia and in urban areas. Skype can’t be used in hands-free mode. Memory stick versus more common SD cards (this is not a drawback if you have other SONY devices). Also uses proprietary microphone cable and charger. Limited functionality when away from WIFI hotspots. Fairly short range WIFI signal. This may also be a good solution for kids who want portable internet access but don’t want to be tethered to a telephone plan.